Request received from site Edinphoto run by Peter Stubbs (UK) with thousands of photos relating to Edinburgh, asking if we can identify car with Boys Brigade people at Gillespie Place. -- Difficult one identified by one of our venerable 'veteran' experts, Tim Harding, who is rarely wrong, who says it is a cca 1903 Darracq, probably the 8HP. The steering wheel column gear change is apparently the clue. Narrow radiator profile? By 1904 'Genevieve' had much more 'modern' radiator. 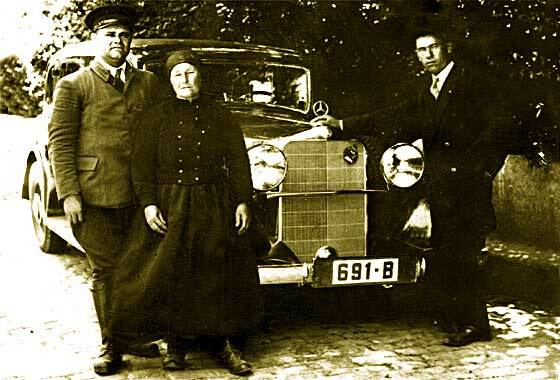 Another Photo received from Job van Huizen (Holland) asking if the SVVS could help him identify this car. He took the photo at the Schlumph Collection but forgot to note the details. 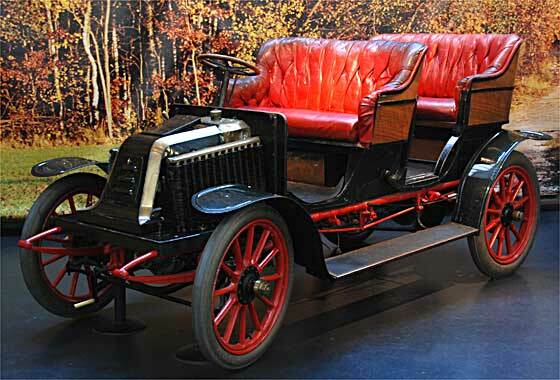 -- Most people think of Renault when seeing a bulkhead mounted radiator but Renault were using side mounted radiators for at least five years before bulkheads in 1905. This is a cca 1903 Renault type NC Double Phaeton. Type N Renaults came in NA, NB and NC versions during the 1903- 1904 period. Very puzzling photo received from Numaweb site (Switzerland) taken by a friend in 1960 in Paris. Can we identify the vehicle? -- Exceedingly unusual car and one our experts could not identify. Radiator at the front and on bulkhead? Back one no fins but a rad cap? The front rad square framed corners. Guess by Tim Harding; possibly a Corre. Much searching later defined indeed a cca 1906 Corre J Coupe 10HP. Founded in 1901 by cyclist Jean Marie Corre in Levallois-Perret making tri/quads. 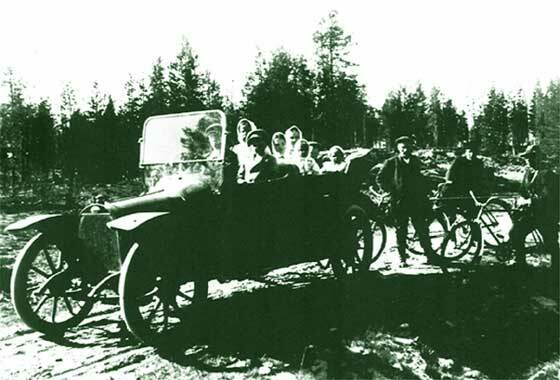 Photo received from Gabriel Ahava (Finland) who would like to know make and year of his father's car pictured about 1915 in a small township of Kuusamo in the North East of Finland. Only a narrow 250 km long mud road led to the nearest town called Oulu. No lights? 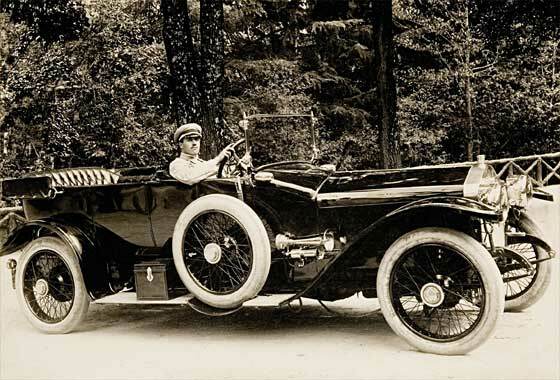 -- Photo looks like a photocopy with no gray tones so no details to help, but three of our experts think it is a cca 1911 Opel 6'16PS Torpedo Double Phaeton. Lights were removable, to save having to clean them. 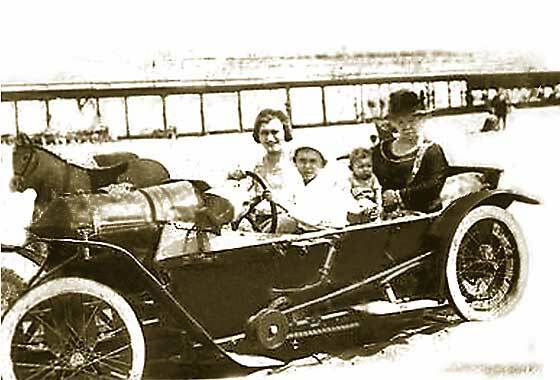 Small blurry photo, which we have enhanced, received from Ashley Rowe (UK) of his great great aunt, which seems to be taken in the UK 1900-20 period, sitting in the back of a car with a pier in the background. Is it a steam driven machine? -- No, not steam very much petrol and very French. 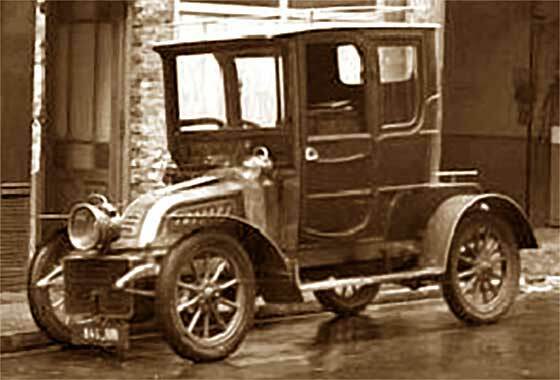 This is a cca 1913 Bédélia Cyclecar. Probably a 'Photographers Prop' because the steering wheel is in the wrong place at the front; should be in the back seat. Paris made 1910 - 1925. Fast !! Fascinating story from Joao Ferreira (Portugal) where mistress of house had affair with chauffeur in photo resulting in her being sent by husband with agreement from her parents to a lunatic asylum for life! Can we advise on make of car. -- Very sad story which shows how times have changed! Wheelnut has writing suggesting GLA.... and upside-down ....LEY. Not a positive ident but one of our experts feels it could be big cca 1914 30'40 Wolseley 6 cylinder. Wheelhubs are good match. A smashing photo sent in by Lindsay Crawford (Australia) which he suspects was taken at a festival in Benalla, Victoria. 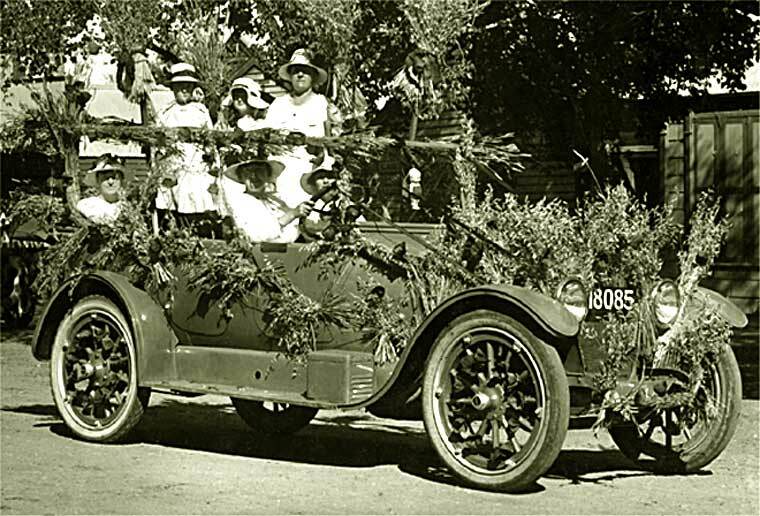 The people in the car are relatives of his grandfather. A really, really tough one but idea on the make, and especially the year, would be useful? -- Help from our friends at the AACA suggested that it may be a Buick. Enlargement of the wheelhub confirmed probability and concealed door hinges and flat mudguards pinpointed it to a cca 1916 Buick D45 Touring, - well hidden! 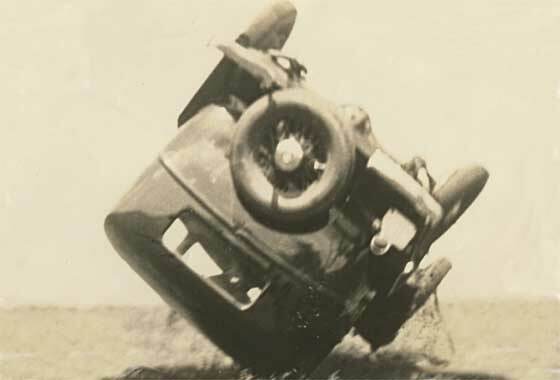 Intriguing photo Posted on AACA website by Daryl (USA) asking for identification. It is right drive car. -- Looks very much like a cca 1921 FIAT 501Torpedo as far as bonnet shape, rad shape, oval badge, mudguards, twin light sets, place for horn in the wood below windscreen, etc etc EXCEPT that these had five wheel studs and this one has four. There was an American FIAT but I think they stopped before this date? Mark Dawber suggests aftermarket wheels & bumper. Interesting cinema screen grab of a vehicle which appeared in a British film "Isadora" made in 1968, where the vehicles are being investigated by IMCDB. Biographical story of Isadora Duncan the famous American ballet dancer-turned exotic dancer, played by Vanessa Redgrave, who lived in Russia and Europe and became equally famous for her death by strangulation when as passenger in an Amilcar her scarf got trapped in the rear wheel. -- This is cca 1926 Austro Daimler 617 Double Phaeton. Lovely photos received from Mario Majarich (Australia) who came with parents from the Dalmatian island of Losinj. 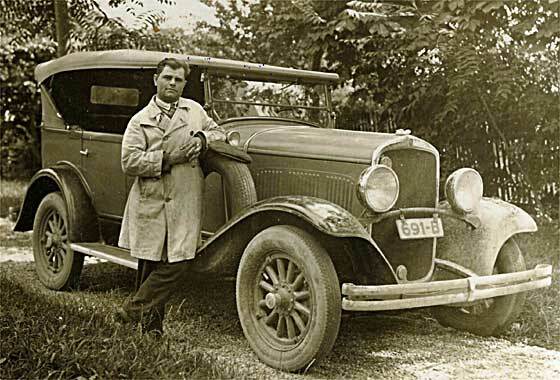 His father was the first with a Taxi and trucks on the island, and Mario wanted to know details.--Darkish circular badge with lighter thin writing, headlamp and side-lamp in one unit, chunky front to mudguards, no hinge or embellishment on the bend of the bonnet between top and side, and it being a quite large looking car, indicates this is a cca 1926/7 FIAT 507 Torpedo Tourer. Yet another lovely photo received from Cicos Florin in Constanta by the Black Sea (Romania) who is interested in old cars of Romania and Constanta. 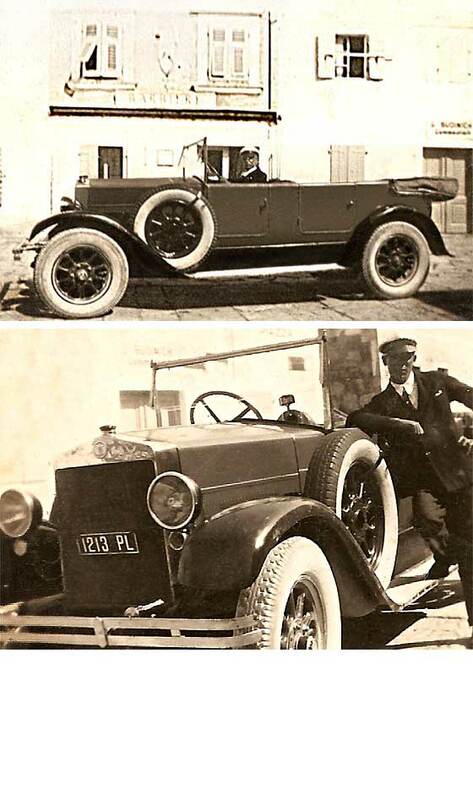 -- Same car on left in two photos, being a cca 1928 Ford Model A Phaeton. Reg plate has white background. The car on the right is a cca 1925 Chrysler B70 Touring, black reg plate, with what seems to be a live cat or squirrel on bonnet. This photo seems to feature the same people as item below, showing them here in civvies and off duty. Yet another lovely photo received from Cicos Florin in Constanta by the Black Sea (Romania) who is interested in old cars of Romania and Constanta. 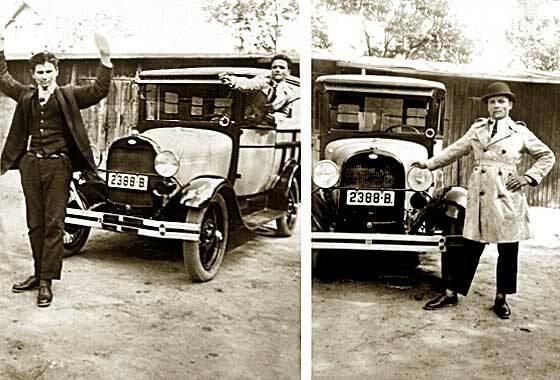 -- Same car on left in two photos, being a cca 1928 Ford Model A Phaeton. The car on the right is a cca 1928 Chrysler 72 Sedan. 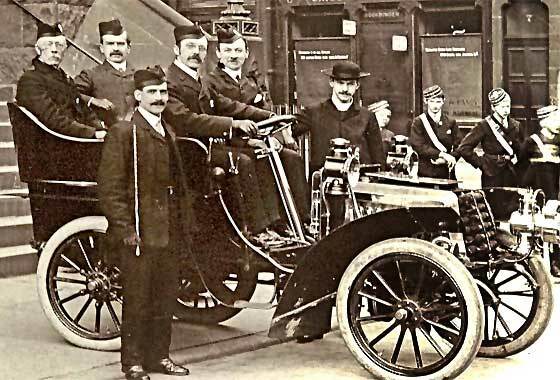 This photo seems to feature the same people as item above, which is showing them as chauffeurs or taxi drivers. Note the Ford change of reg plate colour to black, perhaps signifying it is now taxi, -or converse! Another photo received from Jonathan Day (USA) which he is trying to identify. He is working his way through 7500 photos left by his Grandfather and is trying to establish details. -- All UK registered. Camping trailer on right so possibly group assembly pre holiday. These two cars are a cca 1928 Austin Burnham Saloon ER 9052 registered Cambridge CC, and cca 1924 Morris Cowley Bullnose CF 5413 registered West Suffolk CC.Two of biggest British mass car makers of the period. Yet another lovely photo received from Cicos Florin in Constanta by the Black Sea (Romania) who is interested in old cars of Romania and Constanta. On the back of this picture is written "Militia" and year 1929, so this could be a Police Car. -- Actually two photos of the same vehicle but nothing to specifically identify it as a police car. 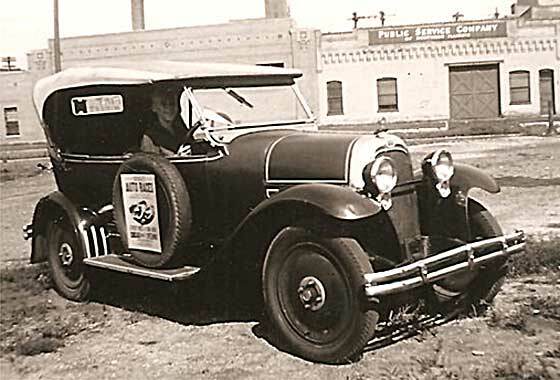 The body style with the stepped bulkhead was discontinued after 1929, painted rad, so this is a cca 1929 Ford Model A Station Wagon with probably non-Ford body. Another photo received from Jonathan Day (USA) which he is trying to identify. He is working his way through 7500 photos left by his Grandfather and is trying to establish details. -- All UK registered. Camping trailer on right so possibly group assembly pre holiday. These two cars are Jowetts, a cca 1929 Jowett 7'17 Saloon UV 7058 registered London CC, and cca 1925 Jowett 7 Tourer MR 2973 reg Wiltshire CC. Jowetts were made in Bradford, Yorkshire, and evolution of one model. Yet another lovely photo received from Cicos Florin in Constanta by the Black Sea (Romania) who is interested in old cars of Romania and Constanta. 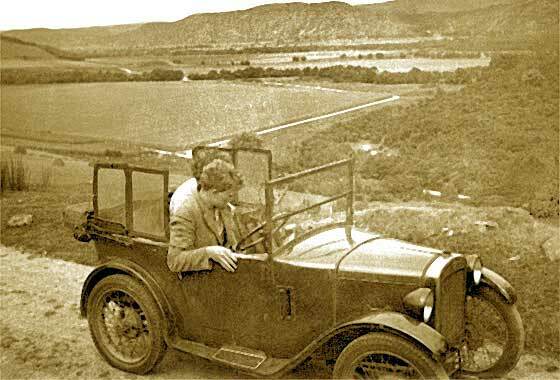 -- A car which caused a sensation in the USA when launched by having a record over 81,000 units of various models sold in 1929, its first year. From the curved bonnet louvre plate this is a cca 1929 DeSoto Series K Four Door Phaeton. A Chrysler product named after Spanish explorer who discovered the Mississippi in 1541. Ended in 1942. Another photo received from Jonathan Day (USA) which he is trying to identify. He is working his way through 7500 photos left by his Grandfather and is trying to establish details. -- This one carries a UK registration but letters are obscured, hiding the place and date of issue. 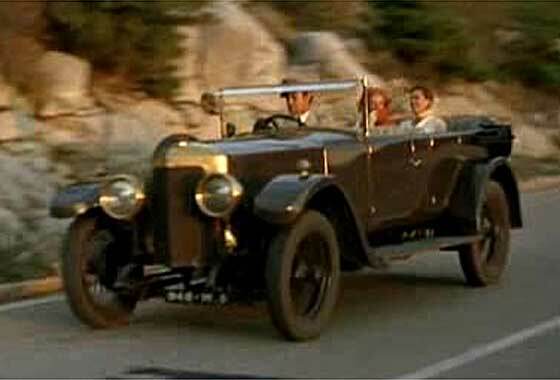 The car is one of the most popular UK cars of the era, confirmed by our Austin racer John Caddy as having nickel radiator with a rubber ring and side vent, and lights at the front, so a cca 1929 Austin Chummy Tourer. 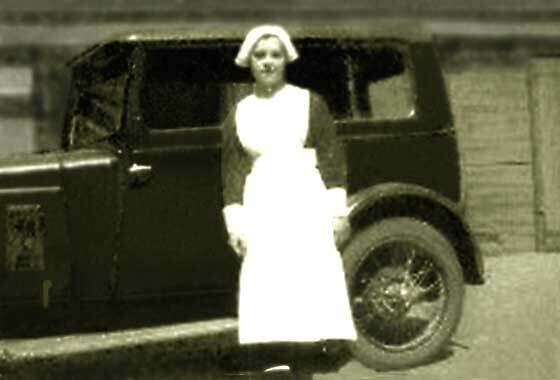 Small blurry photo, which we have enhanced, received from Martin Dornan from Glasgow (UK) taken in Scotland of his Grandmother. She was borne cca 1912/3 and looks about 20 years old, giving a photo date of about 1933. -- Very rakish lines of the bodywork are indicative of a small by then Morris subsidiary Wolseley. This is a cca 1931 Wolseley Hornet. These were initially fitted with Morris Minor type bodies but became very popular sporting variety of coachwork and special bodies. Yet another lovely photo received from Cicos Florin in Constanta by the Black Sea (Romania) who is interested in old cars of Romania and Constanta. -- A very pretty and interesting car. Looks American but is generally too small. Badge when enlarged is rectangular and tall, with flat bottom which seems to suggest a FIAT of the 1932 to 38 period. Badge is high up on an unusual rad which suggests an early cca 1932 FIAT 508 Balilla Torpedo, but possibly one built by Polski FIAT Warsaw? Intriguing grainy photo received from Jerome Simon (France) who purchased it from the USA but the seller has not given him any information about it. -- Action photo of a car rolling over onto its roof. Looks much like a UK Ford model Y but our antipodean correspondent Mark Dawber has come up with the probable answer: cca 1932 Rocne 65 built by Studebaker to commemorate the just died US football player. Economy car made only 1932-3 in Detroit, various models, 23,000 sold. 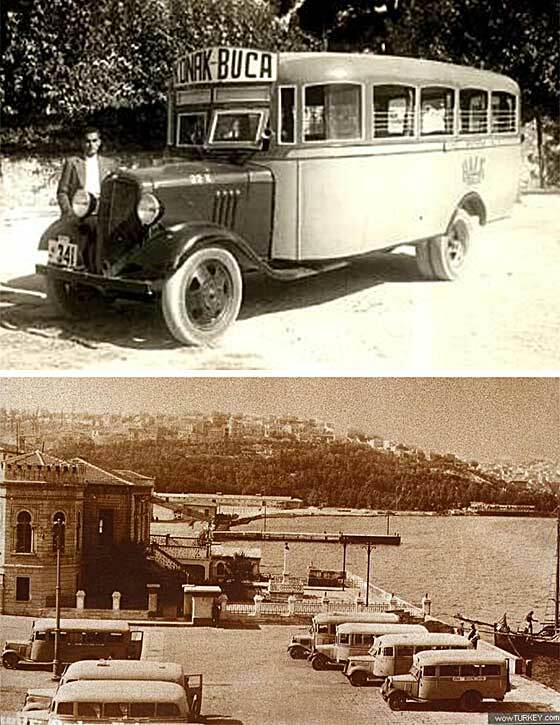 Two photos with no text received from Dr. Alper Ozgonul from Izmir, (Turkey) showing busses. We have tried to get further info but no reply so far, so we are assuming he requires identification. -- The busses look American so we turned to our colleagues at the AACA for help and they have confirmed American. Single photo shows a cca 1934 Chevrolet Bus with four louvres, same in the multiple photo, horisontal louvres are '35 Chev, close louvres in background could be Dodge, but photo too small. 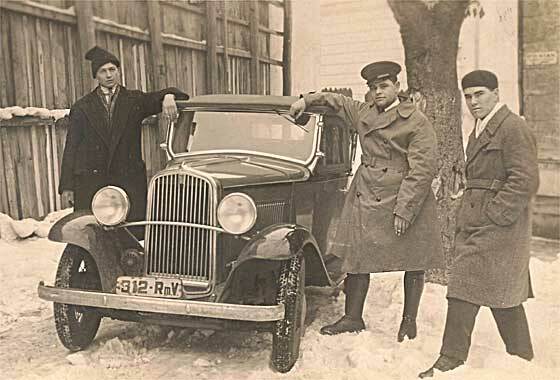 Yet another lovely photo received from Cicos Florin in Constanta by the Black Sea (Romania) who is interested in old cars of Romania and Constanta. -- A very difficult model to identify precisely as all salient identification details are hidden by the people standing in front of the car. However from the windscreen, three rows of side windows and the length of the car it is reasonable to conclude that this is from the range of cca 1935 Mercedes-Benz 2** Lang Pullman Limousines, made 34/37. Photo received from Susan George (Australia) asking if we can help with identifying the year of a car that she understand is an "Austin 10"? 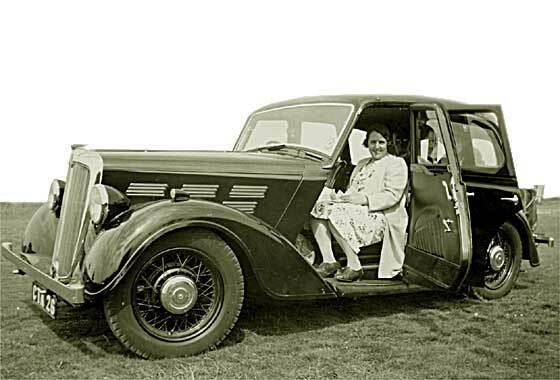 The photo is of grandparents and an unknown elderly couple from Kent, with apparently a Devon number plate issued after 1936. -- Later she corrected to a "Morris Ten" , which indeed is exactly what it is. Also correct with the registration. The car is a 1936 Morris 10/4 Series II Saloon registered at Devon County Council in approx. September 1936. Photo received from Kim Carleton (USA) saying he inherited postcard from his grandmother. His step-grandfather used to race motorcycles in the early 1910's and owned a motorcycle shop in Springfield, MO. Postcard says this motordrome is not the same as the one in Springfield. 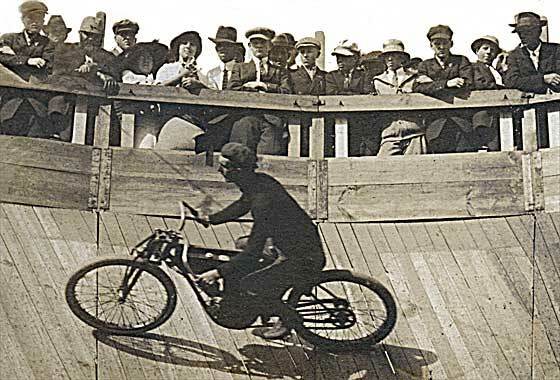 Postcard from friend Charles Biegenwall dated December 12, 1913.-- Our bike expert Robin Vince thinks it might be a Flying Merkel 980cc, V-twin, by Miami Cycle & Manuf. Co of Middletown, Ohio. 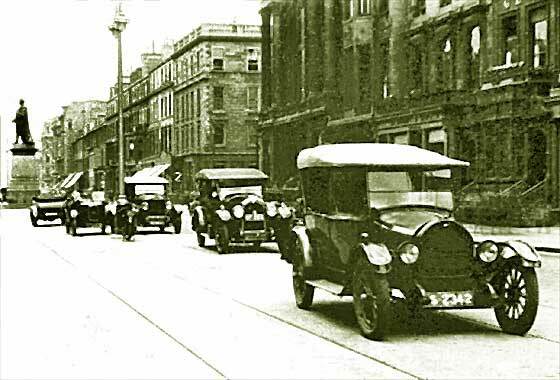 Request received from site Edinphoto run by Peter Stubbs (UK) where they have thousands of photos relating to Edinburgh life in all its aspects, asking if we can identify a number of cars in George Street, and when. -- Seems to be mainly American cars. Front to back: Cca 1919 Overland Model 90, 1924 Buick Standard Six, cca 1923 Moon 6'58 Sport Phaeton , cca 1922 Rover Eight. Cannot make out enough on the last car, back on. Slightly hesitant on the Moon, but unlikely to be Rolls.